Sen. Michael Bennet, left, listens to Kristin Kenney Williams of Vail Resorts during a wilderness bill meeting atop Breckenridge ski area (Vail Resorts photo). BRECKENRIDGE — Sen. Michael Bennet on Wednesday announced he’ll introduce a bill this session to protect more than 58,000 acres of public land in Eagle and Summit counties as wilderness. 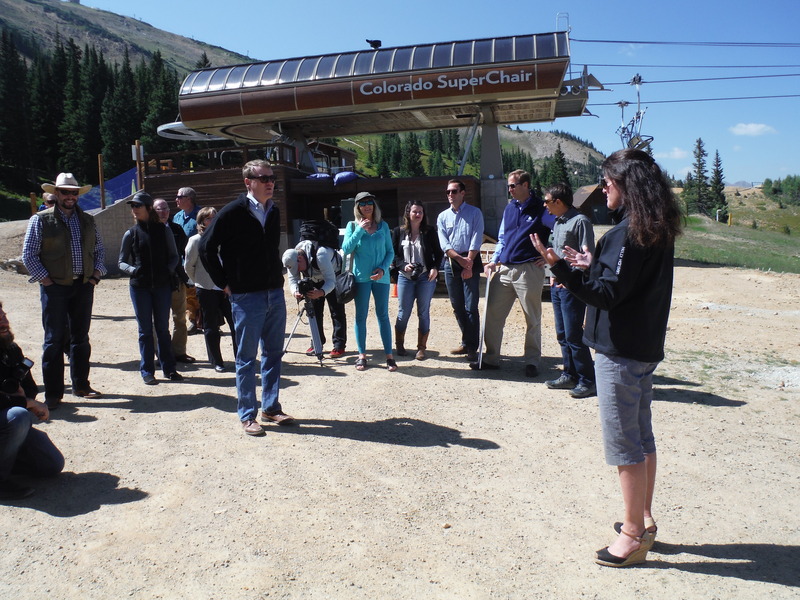 Bennet made the announcement at a press event in Breckenridge attended by local politicians, area residents and business leaders. The Continental Divide Wilderness and Recreation Act will be the Senate version of bill introduced earlier this in the House by Rep. Jared Polis, D-Boulder. Polis, a member of the House Natural Resources Committee, has been working on the bill since late last decade, paring it down from the original and highly controversial 342,000-acre Hidden Gems proposal. After dozens of town halls and other public meetings over the years, Polis in 2010 scaled back the proposal to just Eagle and Summit counties (eliminating any land in Pitkin and Gunnison counties) and introduced a bill that would still have put the more restrictive wilderness designation on nearly 166,000 acres. Now it’s down to just over 58,000 acres, including an 11,500-acre Recreation Management Area within the Tenmile Range in Summit County. It has the backing of groups such as the Wilderness Society, Vail Resorts, the Outdoor Industry Association, the International Mountain Biking Association, Conservation Colorado and many towns, businesses and water districts. Vail Resorts, the largest employer in the two counties and on the entire Western Slope, backed the Polis bill earlier this year. “It is interesting to note that 20 percent of all recreation visits to our national forests take place at a ski area, yet ski areas occupy less than one-tenth of 1 percent of all public Forest Service lands,” said Kristin Kenney Williams, the company’s vice president of mountain community affairs. Wilderness designation does not allow for alpine skiing using mechanized lifts or vehicles. However, Kenney Williams noted that tourism is the state’s second largest industry and that wilderness areas are vital for non-mechanized recreation such as hunting, fishing, hiking and Nordic skiing — — all of which are big economic drivers for local communities. “So we are proud to support this effort that strikes this unique and important balance of being able to offer thoughtfully developed recreation opportunities at our ski areas and the conservation of wilderness,” she added. Mountain biking is not permitted in most wilderness areas, but the special Tenmile Recreation Management Area would protect a huge swatch of public land for off-road cycling. Malin joined Breckenridge Mayor John Warner in praising the process that Polis used to get to this point. Bennet, a Democrat, told the gathering on Wednesday that wilderness designation should not be a partisan issue and was confident he’d be able to get bipartisan support for his bill in the Republican-controlled Senate. Polis did not attend Wednesday’s event but was in Breckenridge recently to tout the proposal, most of which falls in his sprawling 2nd Congressional District. Polis earlier this month toured the Breckenridge Outdoor Education Center and held town hall meetings in Eagle and Summit counties. In other wilderness news, Denver Democrat Diana DeGette once again introduced her Colorado Wilderness Act in the House earlier this month. She has been trying to pass a version of this far more sweeping legislation since 1999, and the latest proposal would protect 32 separate areas consisting of more than 715,000 acres.